This week is Holy Week, or as I’ve decided to call it, Holy Mole Week, because yesterday saw another one of my epic gatherings at Orchard Cottage, this time for a Mexican fiesta party featuring tamales, mole sauce, black beans, salsa and for dessert: chocolate cake and ice cream. My original plan was to do chilli chocolate brownies with vanilla ice cream, but a chocolate tour in Camden with Jennifer Earle and Kavey Favelle introduced me to Artisan du Chocolate and their Lumi milk chocolate bar. Lumis are ripe limes boiled in salt water and sun-dried, giving the the chocolate a fresh tanginess. Given that my meal plan already involved lots of chilli and rich flavour from the mole sauce, I loved the idea of adding a fresh element to the cake, rather than more chilli. Plus, lime was totally fitting with the Mexican theme. As for ice cream, I debated whether to make lime sorbet, coconut ice cream or avocado ice cream, and in the end decided to make all three, it what is now infamously known as “the trio” (a phrase I apparently kept repeating all night long, following many bottles of Prosecco – I still maintain that the phrase has a nice ring to it). All of the ice creams in “the trio” were good, really good, but the avocado was absolutely outstanding and perfect with the cake. 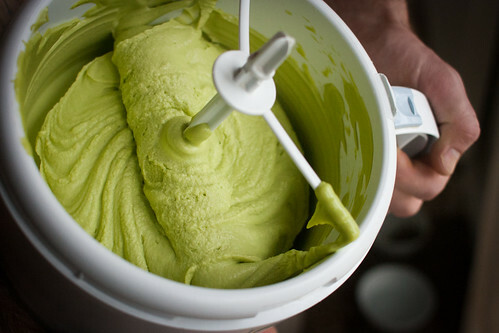 I made the ice cream on Kavey’s suggestion, who did an avocado ice cream on her blog last year. I was ultimately drawn to David Lebovitz’s recipe in The Perfect Scoop for its inclusion of sour cream and lime, both of which sounded perfect for my cake. 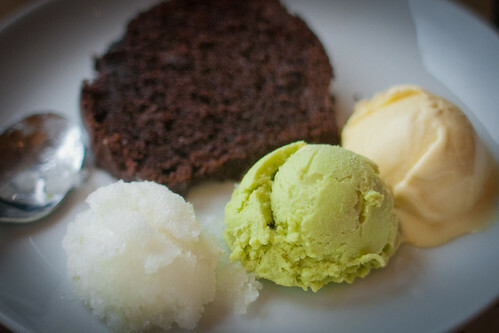 But the avocado ice cream didn’t need the cake at all (though it didn’t hurt): this ice cream totally stands on its own. It’s creamy but fresh-tasting at the same time, especially with that little hint of lime. It was so good that Patrick secretly stashed some extra avocado ice cream in the freezer so that we didn’t eat it all at once. Because we would have. Cut open the avocados, remove the pits, and scoop out the flesh. 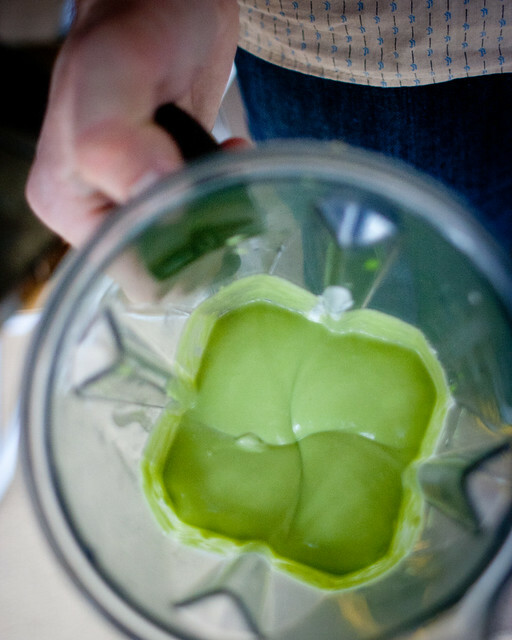 Combine all ingredients in a blender and puree until absolutely smooth. 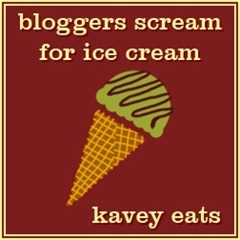 I’m including the avocado ice cream in Kavey’s Bloggers Scream For Ice Cream round-up under the fruit theme (yes, avocado is a fruit!). Oh how I lol’d at the hole mole. This ice cream definitely raises the bar. I’ve always been wary of avocados in sweet things since my green-smoothie-avocado-instead-of-banana-disaster-of-2012. Let’s just say poor George actually drank the thing but I wisely threw it out. So so so disgusting. The sugar & lime juice do make this sound intriguing though! If I ever get that ice cream maker I might have to give it a try.